There are people you meet and you instantly know they will forever impact your life. Then there are people who impact your life before you ever meet them in person. Mahboob Shah is a selfless, kind, and compassionate man who has dedicated his life to helping the poorest of the poor in his native Afghanistan. For the last 25 years, he has assisted and served the many ex-pats (foreigners) who came to Afghanistan to help his people. Shortly after the world turned its attention to Afghanistan because of the kidnapping of two young female missionaries, and the events of September 11, a friend of mine was drawn to the country to help the women and children and their families in this impoverished land. On her first visit to Kabul she and an associate were blessed to have a driver and interpreter by the name of Mahboob Shah. Unlike the majority of the Afghan men she had been cautioned against, Mahboob was gentle, caring, and patient with these two women seeing his war-torn country for the first time. He took them around and showed them the devastation that decades of war had done to his country and his people. They talked for days about what needed to be done to help the people, particularly the women and children whose husbands were either dead or disabled. That’s when my friend knew she had a lifelong friend, one who would not only be a close confidante, but our translator, driver, guard, and the right-hand of the Women of Hope Project. For over ten years, until the project had to leave Afghanistan, Mahboob worked tirelessly every day along with my friend and the other ex-pats who came to help with the project, teaching hydroponic gardening (which he was taught first so he could teach the women), establishing a permanent community for refugees, founding a school for refugee children, and co-managing an embroidery project which enabled over 1,500 women to support their families. He would work 14-16 hour days, when necessary, never once complaining or asking for more money. For the first five years, he worked for no pay and would have continued to do so, had he not had a family to support, because he only wanted to help his people. For years, I volunteered here in the States, behind the scenes, hearing so many stories about this remarkable man. Seven years ago I had the privilege and honor to meet Mahboob in person when I went to Afghanistan to see what our work had accomplished. From the moment I met him, I knew what kind of person he was, and why my friend had trusted him as her second in command for the Project. He became an instant friend and one I will never forget. A man of total integrity in a land where integrity was an unknown word, Mahboob worked faithfully with us for years. He was our driver, our fixer, and our protector. He facilitated our work, helped solve our problems, and kept us laughing and safe, often in very dangerous places and circumstances, at great risk to his own life. Leaving him behind when the project had to close was difficult. We knew how difficult and dangerous his life would be, but Mahboob would never abandon his country or his family. With the ex-pat community mostly gone from the country, jobs are now even more difficult to find. He has not been able to find regular employment, and struggles to support his father, sister, wife, and five small children. Life has been extremely hard, and finances have been stretched to the breaking point. Mahboob has developed a severe case of diabetes, which is quite prevalent in Afghanistan because of the poor diet most families endure. He recently suffered a heart attack which led to fluid accumulating in his lungs and around his heart. He almost died, and has had to go to India for further treatment, as the Afghan healthcare system could do no more. He is now even more concerned, not only for his health, but that there is no one to provide for his family. 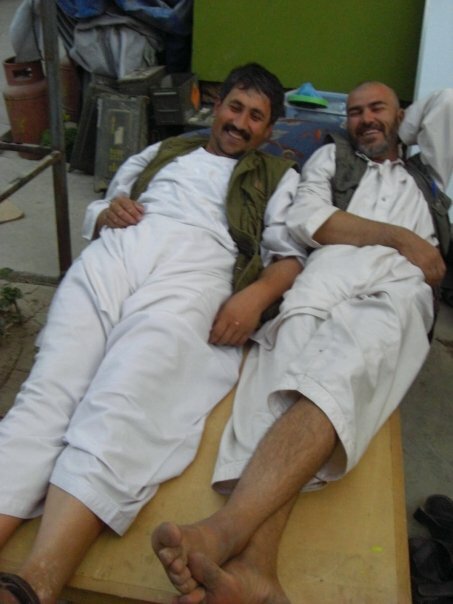 There is no subsidized healthcare in Afghanistan. There is no such thing as Social Security, Medicaid, or disability income. If you do not have the money, you do not eat, you do not receive healthcare, you do not have a place to live. This man, who has contributed so much to so many, has nothing to fall back on. Although his servant’s heart remains as strong as ever, his physical heart does not. A GoFundMe page has been created to raise money for Mahboob’s medical expenses as well as help his family keep going until he recovers. He has no Idea this has been done for him. The link to the GoFundMe page is at the bottom of this blog. Mahboob has given so much to so many. We wanted to share his story with you. Please feel free to share this story on your own blog, your own Facebook page or website. If you can help, we thank you for whatever you can do.